Meet Carly, the first employee to receive a grant from the FirstService Relief Fund. Her daughter is battling a rare disease, Neurofibromatosis 2 (NF2). When she began working at Century Fire in early 2018, she had no idea that support for her family was just around the corner. Carly graciously agreed to share her story in the hopes it might motivate others facing hardship to apply for a grant or inspire associates to consider making a donation. Carly was 3 ½ months pregnant with her daughter Baylee when her baby’s father was diagnosed with Neurofibromatosis 2 (NF2), a rare genetic disorder affecting approximately one in every 40K births. The couple learned that those with the disorder have a 50% chance of passing the disease onto their children. Excitement and anticipation about her pregnancy was quickly replaced by worry and uncertainty. Would her baby be afflicted with the disorder, and if she was, what quality of life would she have? Many people have never heard of NF2, which is characterized by the development of tumors on the nerve which carries sound and balance information from the inner ear to the brain. These non-cancerous tumors are called vestibular schwannomas and can cause severe hearing problems and even complete hearing loss, in addition to a host of other issues. The appearance of signs of NF2 vary from person to person — most experience their first symptoms during their late teens or early 20s, and about 10% develop symptoms during late childhood. Currently, there is no cure for the disorder. For the first 12 years of her life, Baylee was like any other happy, active, athletic kid. A talented volleyball player, she loved being part of a team and enjoyed the camaraderie and friendships she developed through sports. But soon, life as she knew it would drastically change. Baylee began experiencing symptoms of NF2 and test results confirmed the worst. Looking at Baylee, now 16, you would never know anything was wrong – there are no outwardly visible signs she suffers from such a difficult disorder. But every day is challenging for her. She has suffered breathing and speech problems due to a 50% shut airway and paralyzed vocal chord, and lives with many of the common effects of NF2 including hearing loss and a constant ringing in her ears, dizziness, nausea and, most recently, pain in her lower back caused by a tumor growing at the base of her spine. Baylee receives bi-annual MRIs to monitor the growth of her tumors and attends speech therapy sessions to assist her with her breathing, which have been very helpful for her. Many NF2 experts advise patients not to have the tumors removed because doing so presents high risk of more severe damage to the affected nerves. Although the overall cancer risk is low, the tumors can lead to significant medical problems, depending on the number of them and their proximity to the brain. Determined not to let her disorder define her, Baylee is a standout student who takes pre-AP classes and is ranked 63rd out of 564 kids in her class. Although she has had to give up a lot – playing volleyball is no longer an option for her — she is determined to make the most out of life and not dwell on the things she can’t do. Since Baylee’s diagnosis, Carly has dedicated herself to learning as much as she can about her daughter’s condition, and providing support for other families in similar situations. 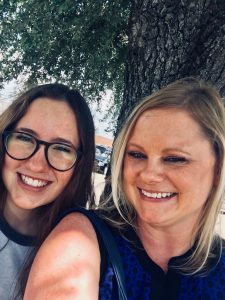 She volunteers at Texas Neurofibromatosis Foundation in Dallas and is forming a fundraising team for a charity walk benefiting the Children’s Tumor Foundation. If you are facing personal hardship we encourage you to look into the FirstService Relief Fund. And if you are able to donate, please consider doing so. Every dollar donated goes to help our people in need, and no amount is too small.